“John Shore is sharp, he’s funny, and he’s right. To find out why I’ve called him America’s preeminent non-douchey Christian, buy and read this book. 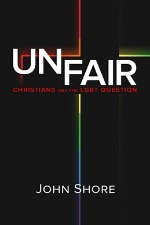 And I challenge anyone who believes that the Bible justifies the persecution of their gay and lesbian neighbors–particularly those on the religious right who’ve made lucrative careers for themselves out of bearing false witness against their gay and lesbian neighbors—to read this book’s opening essay, Taking God at His Word: The Bible and Homosexuality. — Dan Savage (American Savage, Savage Love, founder of the It Gets Better Project). Find out what the experts say on the science of sexual orientation at LGBTScience.org, an ongoing project of Truth Wins Out (TWO) exploring the latest research and interviewing key scientists who have studied human sexuality. Find information and resources about the welcoming church movement, and find a welcoming church near you, at the Institute for Welcoming Resources. GayChurch.org is a web site dedicated to ministering to the Lesbian, Gay, Bisexual and Transgender (LGBT) Christian community and friends of our community. It features the largest welcoming and affirming church directory in the world. Looking for a Christianity that keeps the Christ, but loses the inanity? Try Unfundamentalist Christians.